I had another go with Trench Hammer this evening, same scenario, but with a couple of important differences, inspired by this discussion on TMP. I actually remembered to apply the firing bonus for shooting at targets that move in the open. This counts even in firefight rang or the assault, so really benefited the defender. I also made the to hit score when firing at previously unspotted enemies 11+. It lets the defender hold their fire at least until firefight range with little chance of incidental damage without adding complications with reaction fire and separate spotting rules. I removed the +1 firing negative for MG08/15 teams that move and fire. Here is a brief recap, not blow by blow like last time, but you can see the difference those changes made. Click pictures to enlarge. Pretty much the same setup as before. 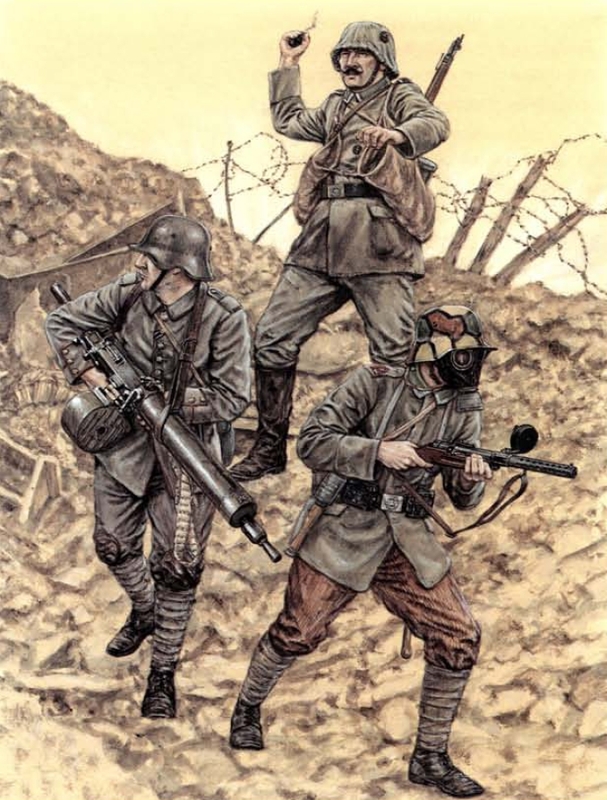 The British from left to right have a Lewis Gun section, Vickers HMG, and a plain old vanilla Rifle Section. The Hun starts out pretty much as before, but the fire from the MG08/15's in the hill is pretty ineffective. The British then open up, with the Lewis Section taking a little damage from return fire, but mostly the boche know we are here! The next turn sees the German Platoon leader stops and regroups one of his rifle sections while the other engages in an ineffectual firefight with the Lewis Section. Meanwhile, the Vickers adds more fire to the Huns on the hill and the rifle section delivers enough fire to cause one of the MG08/15 sections to break! I assume they are not all dead, just had enough for this fight and combat ineffective. 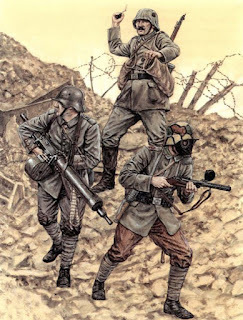 Maybe setting up the MG08/15's on tops of a hill with no cover was not the best idea, as the British knock out the other section. Meanwhile, the German rifle sections get close enough to assault the Lewis Section, they take some damage, but the Lewis must have jammed and they scamper off, combat ineffective. So, the Germans are down to their rifle sections and decide to gamble on a frontal assault on the Vickers. What a terrible idea! They are mowed down for their troubles and the remaining rifle section decides to high tail it out of there. If I were running this as a campaign, I would probably let the British player get his Lewis Section back, as the survivors rally and the platoon leader cross levels his sections. Meanwhile, I'd reinforce the Germans and maybe allow a flanking attack through the woods. Could be interesting, stay tuned. Not a major update, but I did add to my static site with information I use for wargaming the Great War. I hope you find it useful!